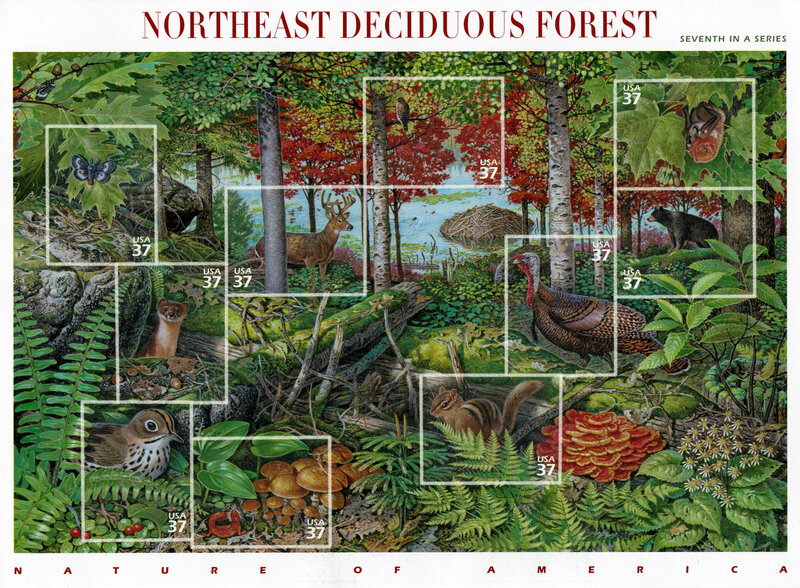 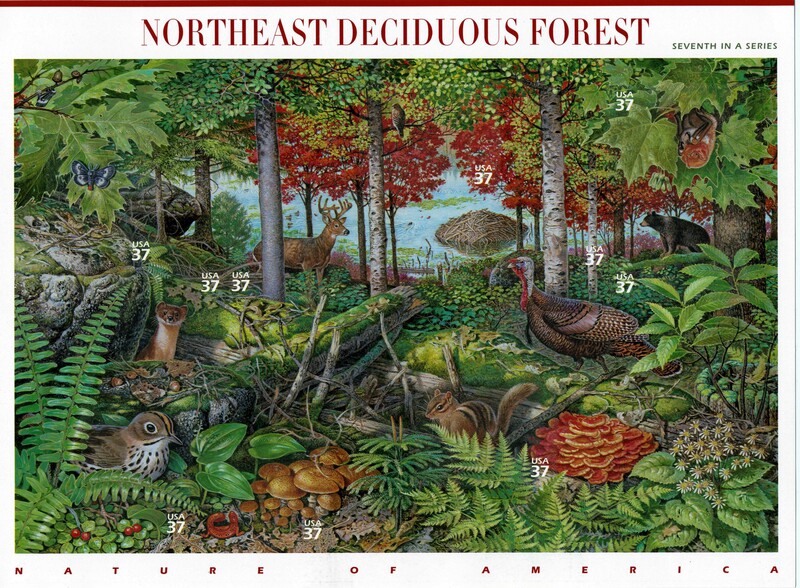 The most notable issue in this section is the USA sheet of 2005 [VIEW], which illustrates a Northeast Deciduous Forest theme, with the stamps in the series being a mosaic section of the overall scene. 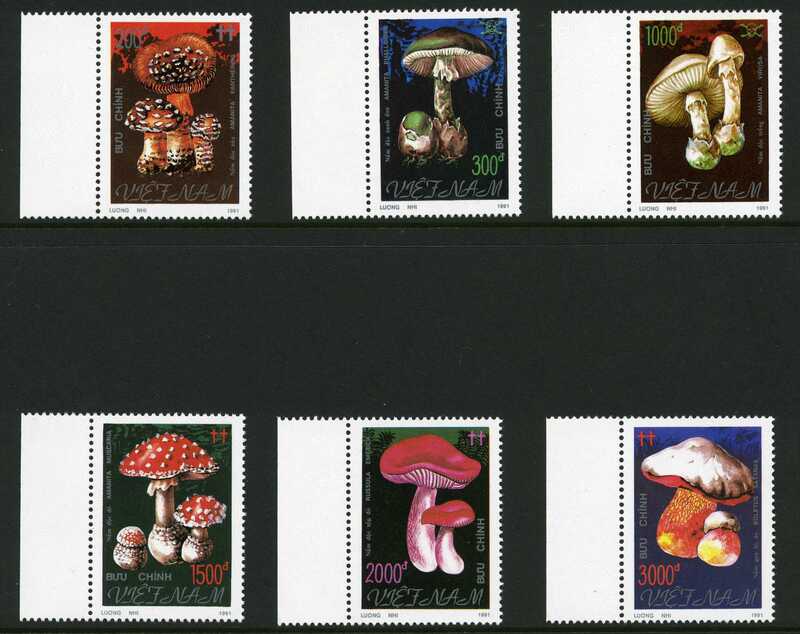 There are ten postage stamps in the sheet, all of 37 cents face value. 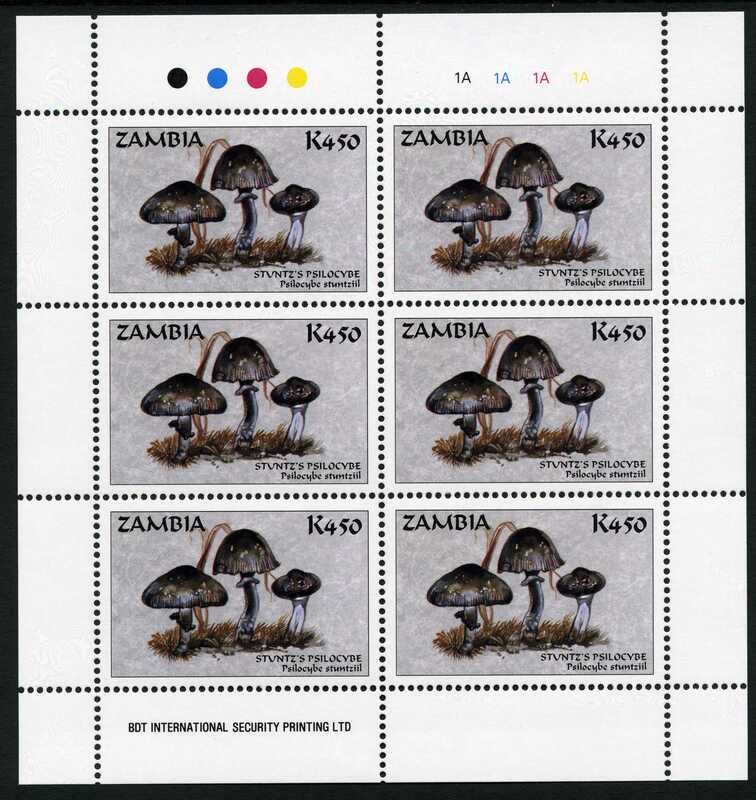 However the stamps are self-adhesive, so they are peelable rather than perforated and consequently difficult to recognise on the image of the sheet. 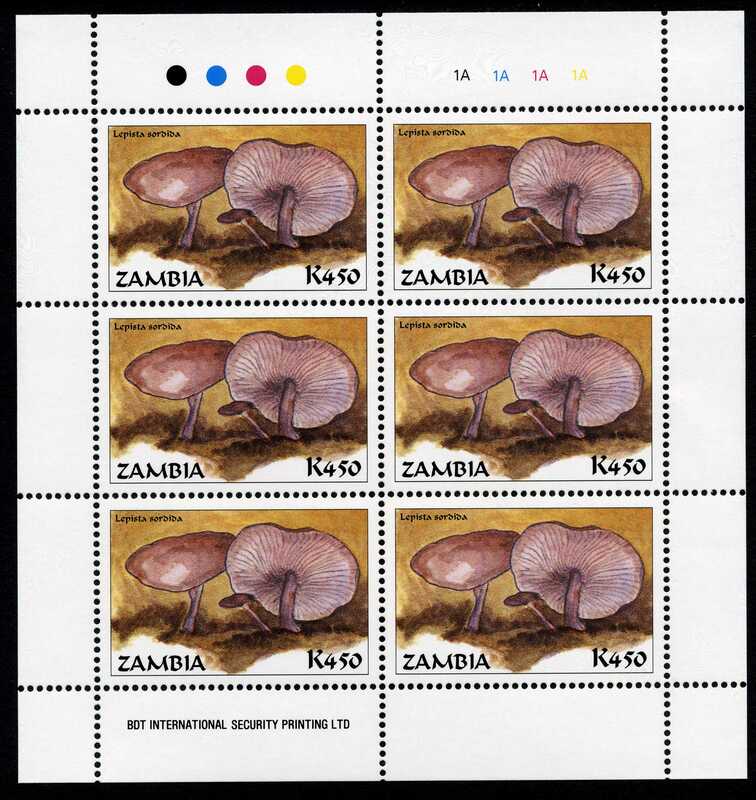 Compare the original sheet with this graphic in which I have outlined the stamp margins to emphasise the distribution of the stamps within the sheet [VIEW]. 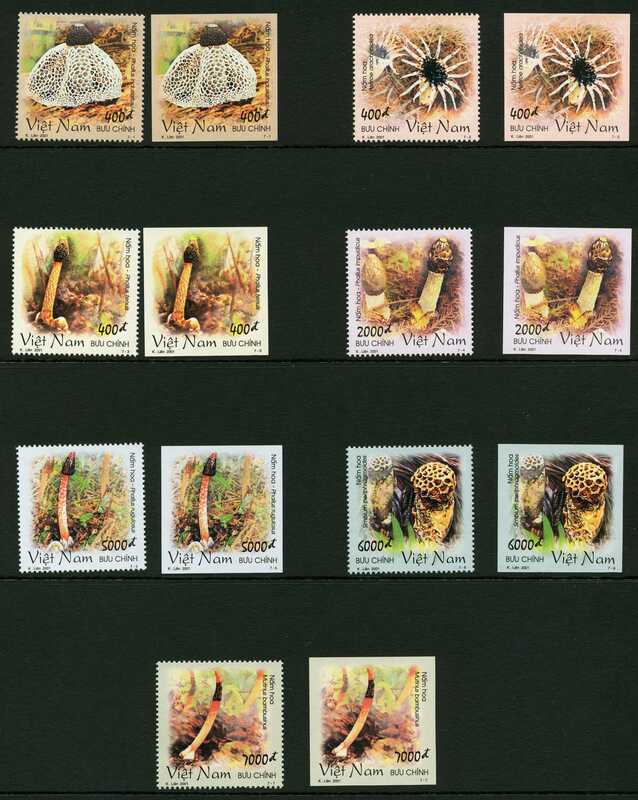 Vietnam 1996 2068 Morchella conica, mint stamp plus overprinted 'specimen' plus IMPERFORATE stamp. 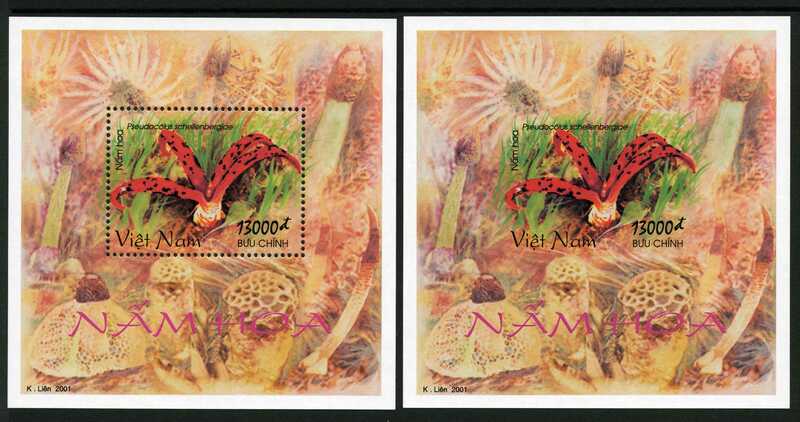 Vietnam 1996 2069 Anthurus archeri, mint stamp plus overprinted 'specimen' plus IMPERFORATE stamp. 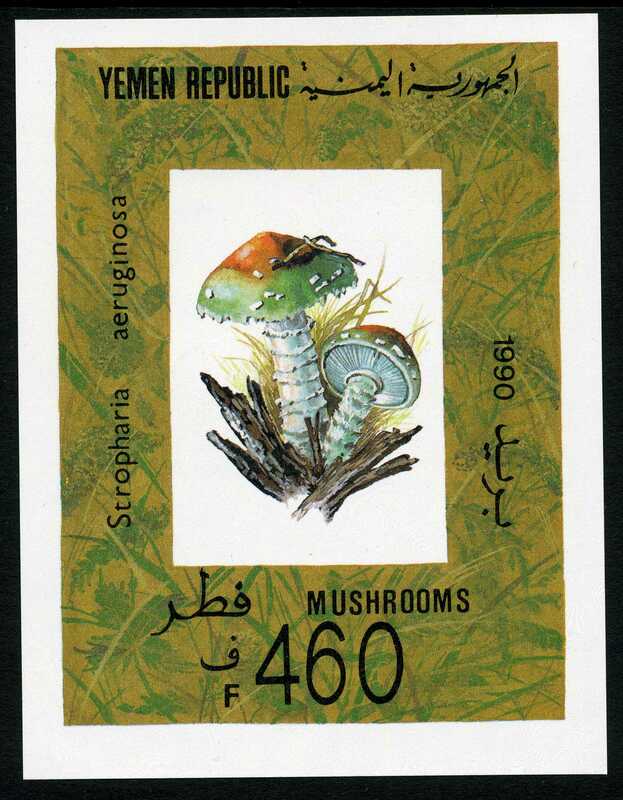 Vietnam 1996 2070 Laetiporus sulphureus (as seriphureus) Chicken mushroom, mint stamp plus overprinted 'specimen' plus IMPERFORATE stamp. 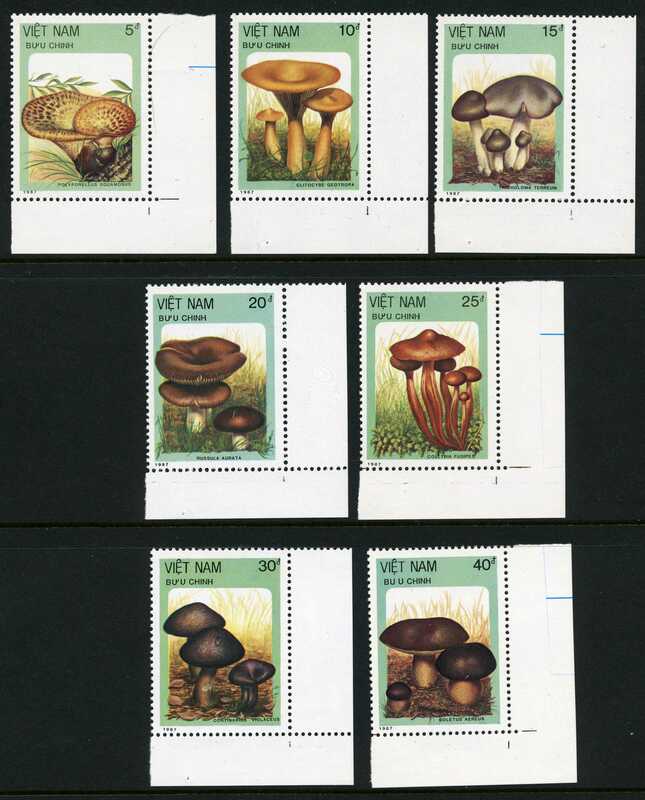 Vietnam 1996 2071 Filoboletus manipularis, mint stamp plus overprinted 'specimen' 'plus IMPERFORATE stamp. 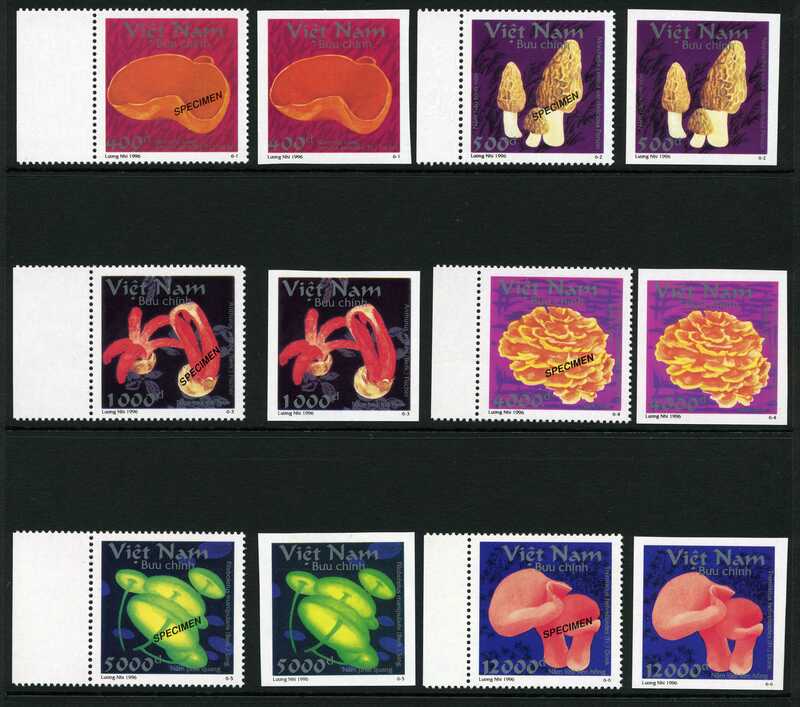 Vietnam 1996 2072 Tremiscus helvelloides, mint stamp plus overprinted 'specimen' plus IMPERFORATE stamp. 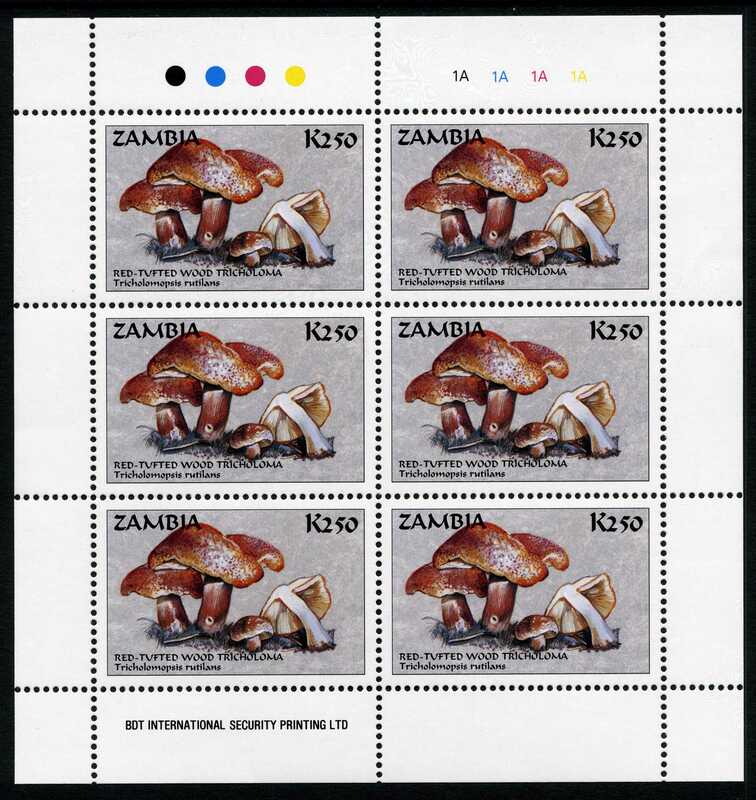 Yugoslavia 2000 3237 Grey partridge (different). 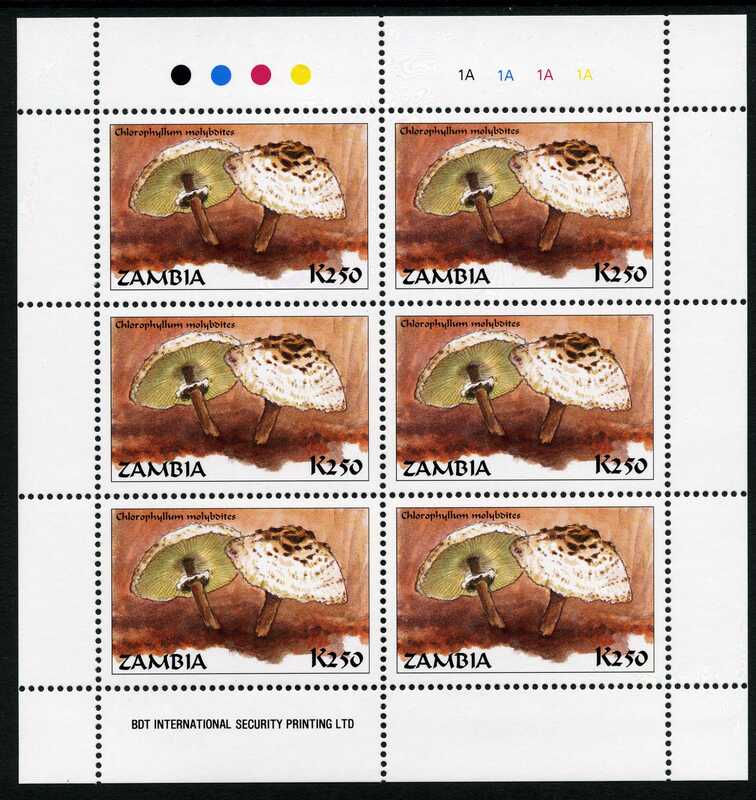 Yugoslavia 2000 3238 Rock partridge (Alectoris graeca) on nest. 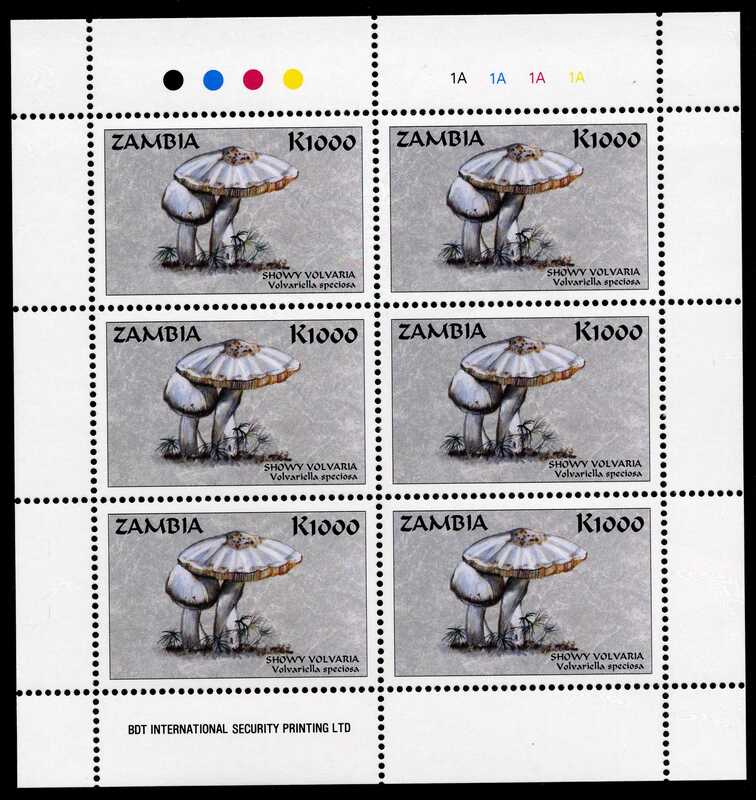 Yugoslavia 2000 3239 Two rock partridges. 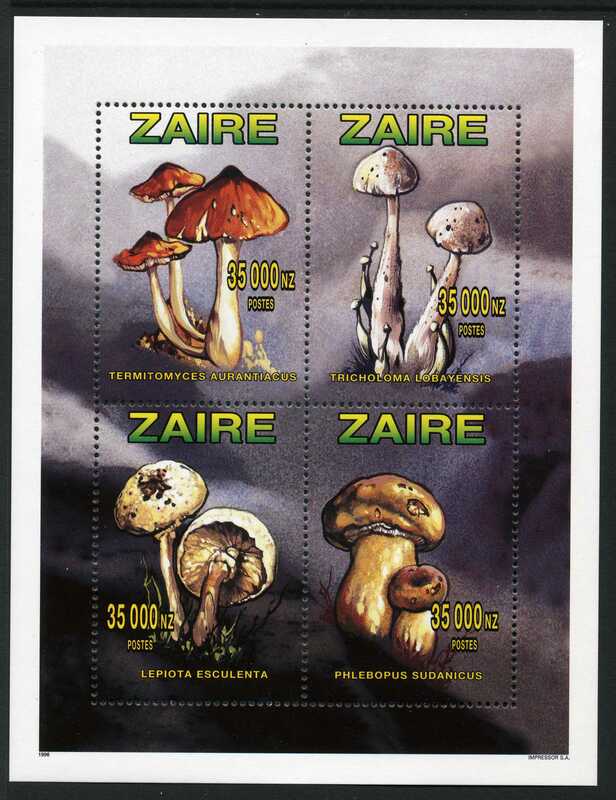 Republic for other issues] 1996 DM1996 Minisheet 100 x 130 mm, four stamps, all 35000 NZ face value, all vert., Termitomyces aurantiacus, Tricholoma lobayensis, Lepiota esculenta, Phlebopus sudanicus. 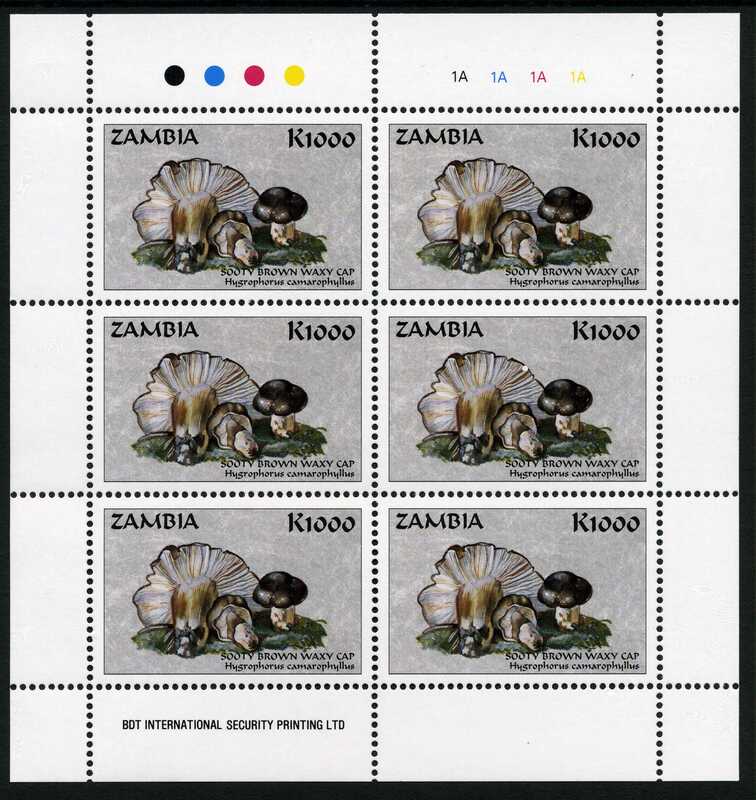 Two versions of the sheet, one perforate and one imperforate. 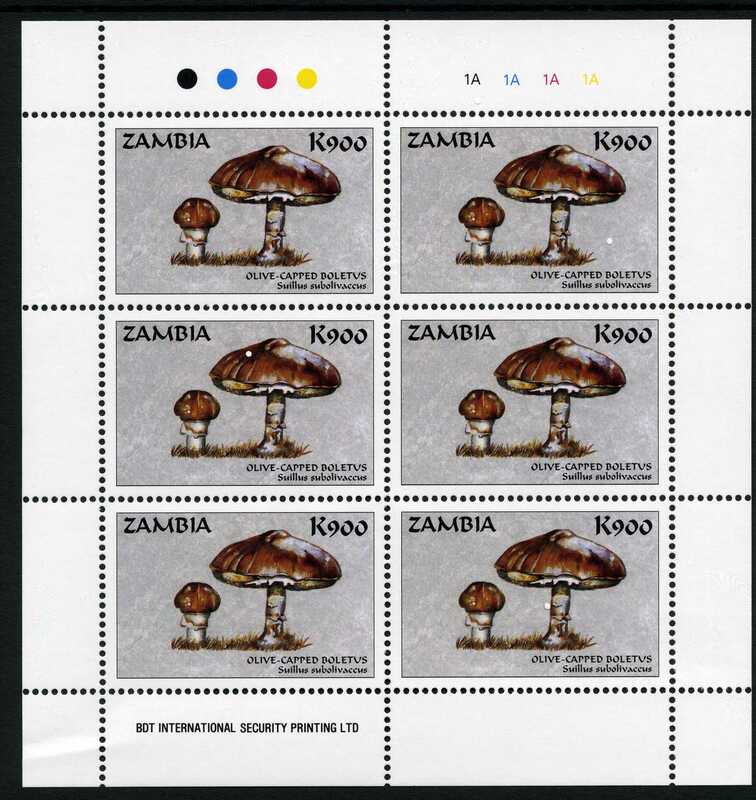 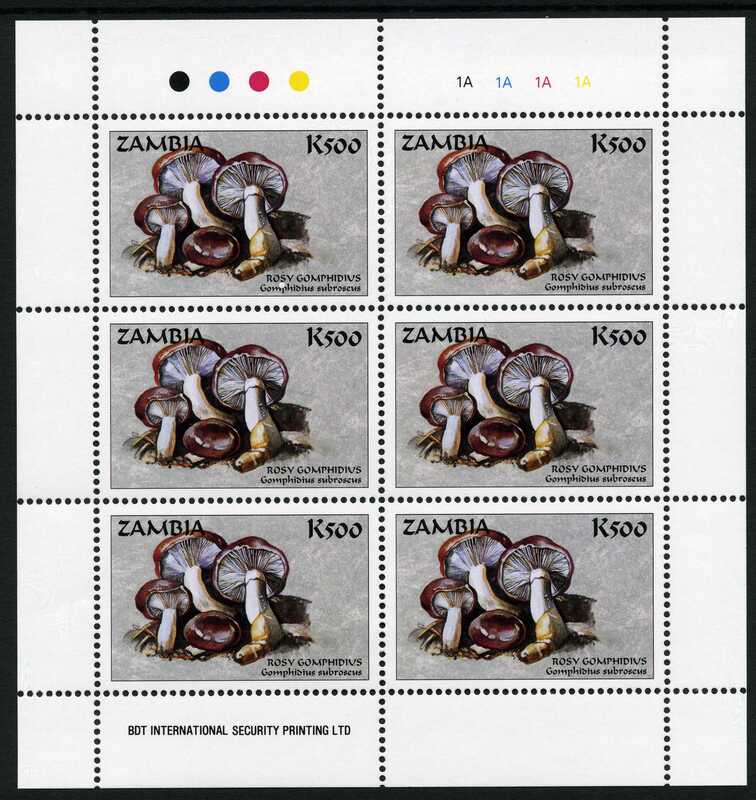 Zambia (formerly Northern Rhodesia) 1998 DM1998 Set of 10 sheets, 110 x 114 mm, of six identical stamps, all horiz., (a) 250 kwacha face value, Chlorophyllum molybdites [VIEW]; (b) K250, Tricholomopsis rutilans [VIEW]; (c) K450, Lepista sordida [VIEW]; (d) K450, Psilocybe stunzii [VIEW]; (e) K500, Lepiota sp. 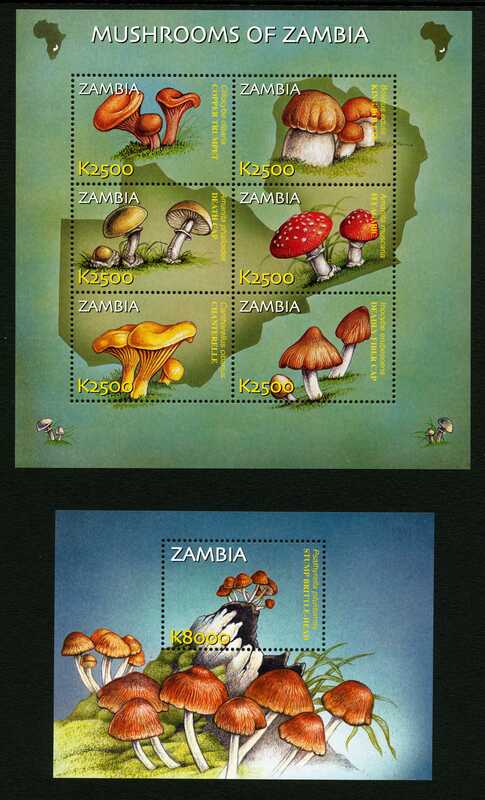 [VIEW]; (f) K500, Gomphideus subroseus [VIEW]; (g) K900, Cantharellus cybrina [VIEW]; (h) K900, Suillus subolivaceus [VIEW]; (i) K1000, Hygrophorus camarophyllus [VIEW]; (j) K1000, Volvariella speciosa [VIEW]. 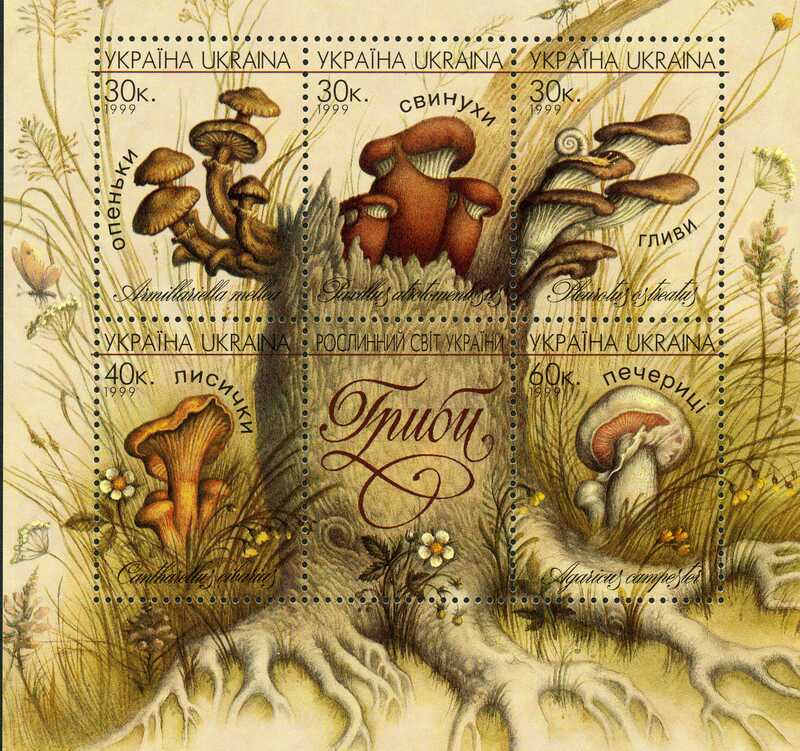 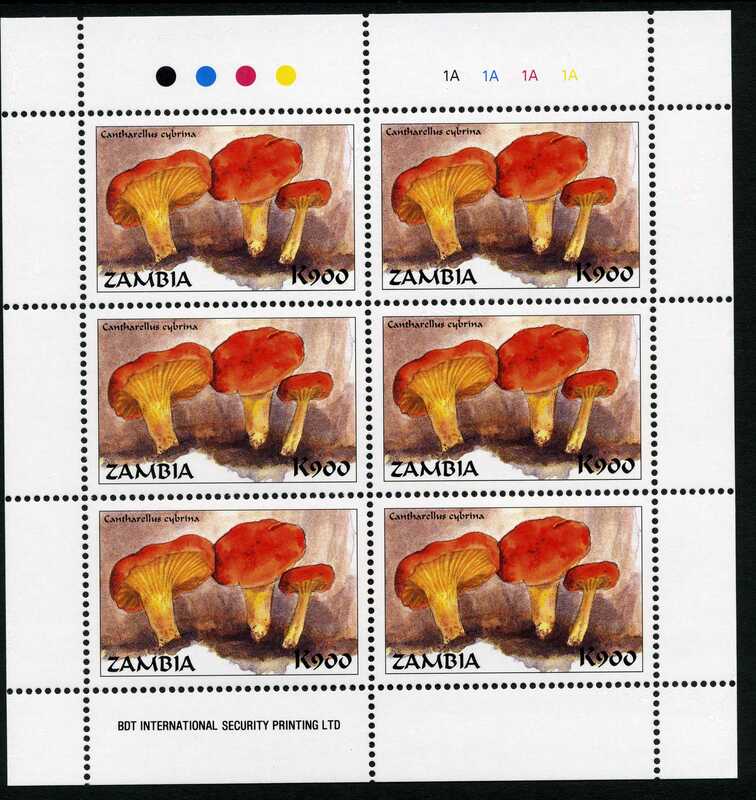 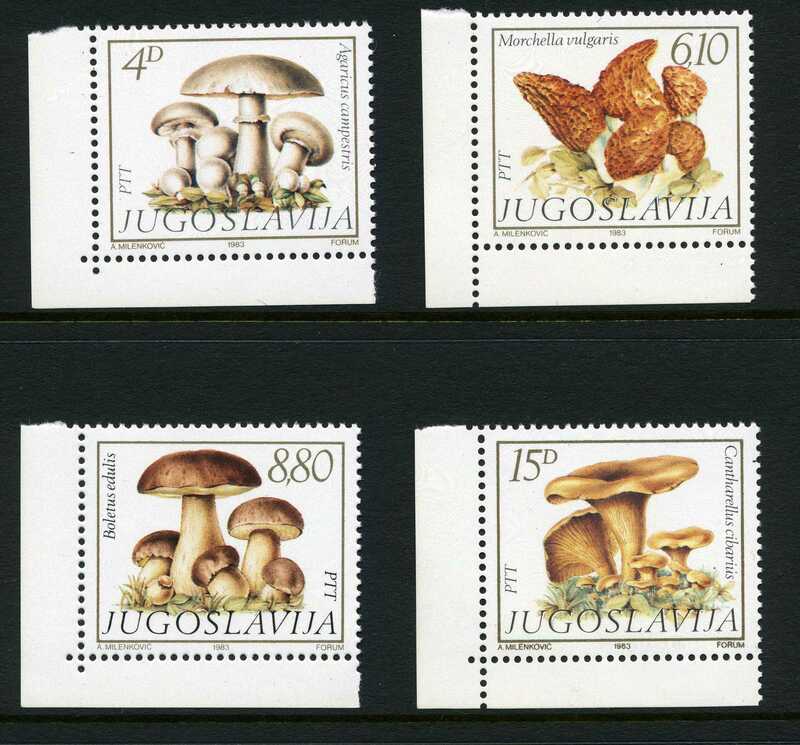 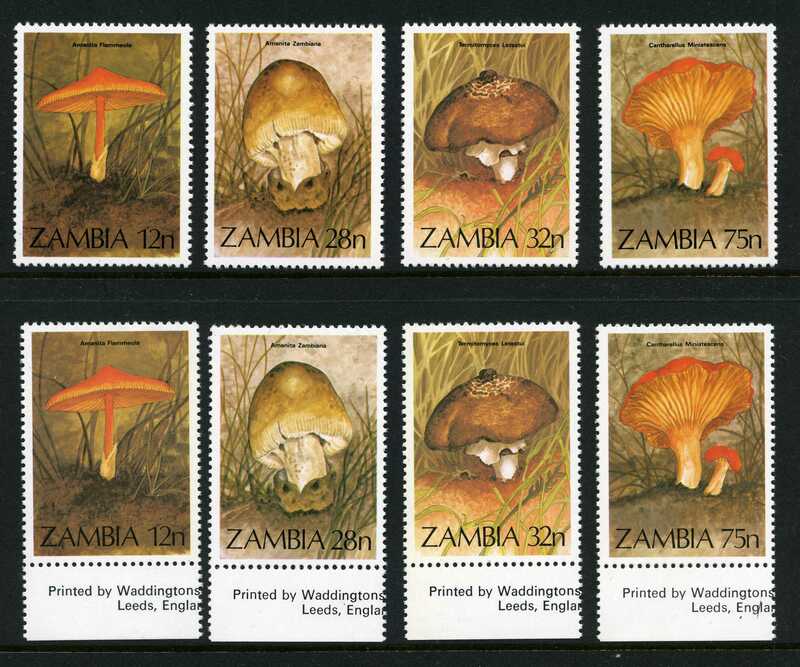 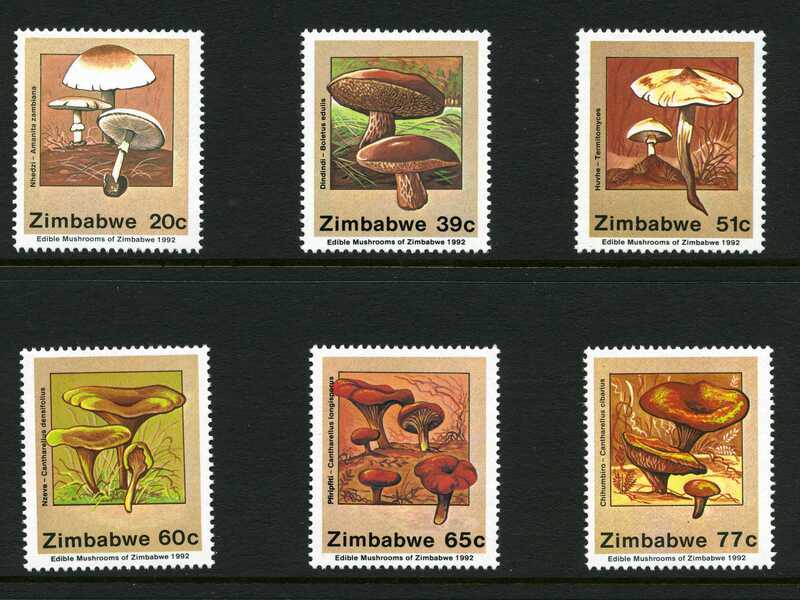 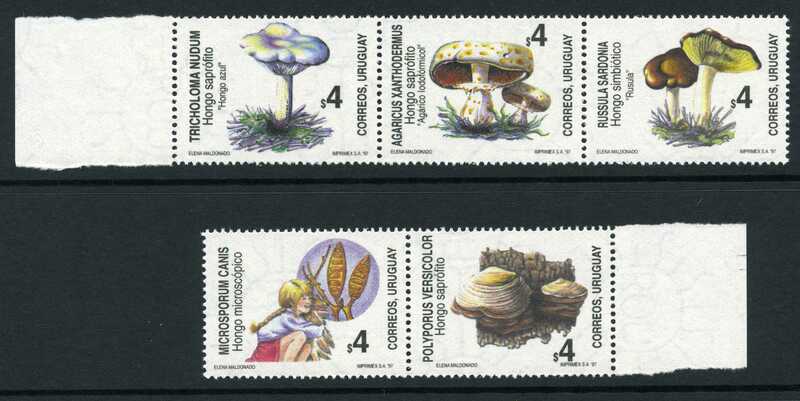 PLUS sheet, 96 x 111 mm, of six different stamps, all horiz., all K900; Boletus lelleri, Russula brevipes, Clitocybe odora, Stropharia semiglobata, Collybia dryophila, Stropharia rugosoannulata. 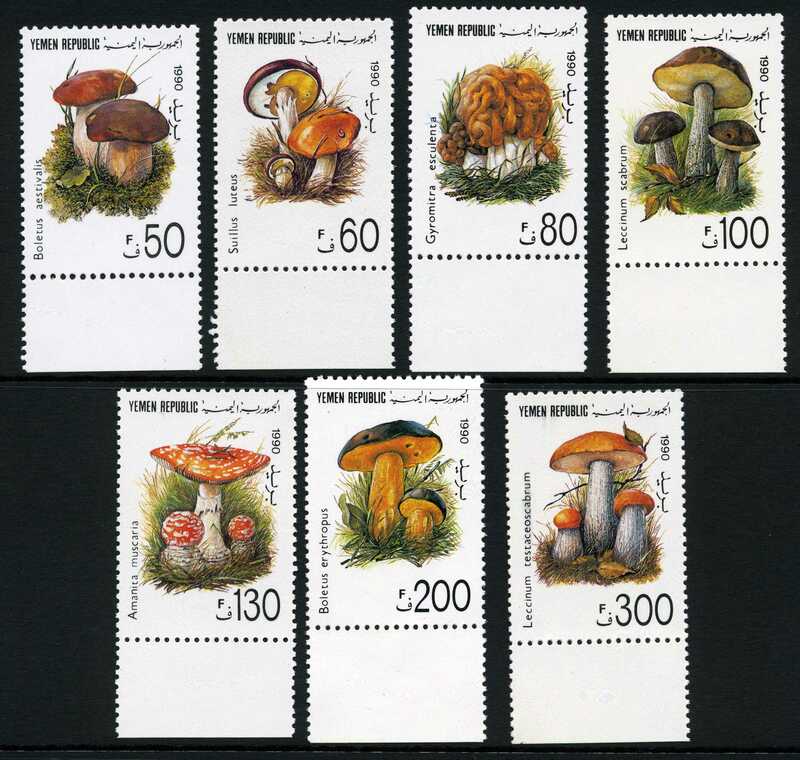 PLUS single-stamp sheet, 106 x 76 mm, K3200, Armillaria mellea [VIEW]. 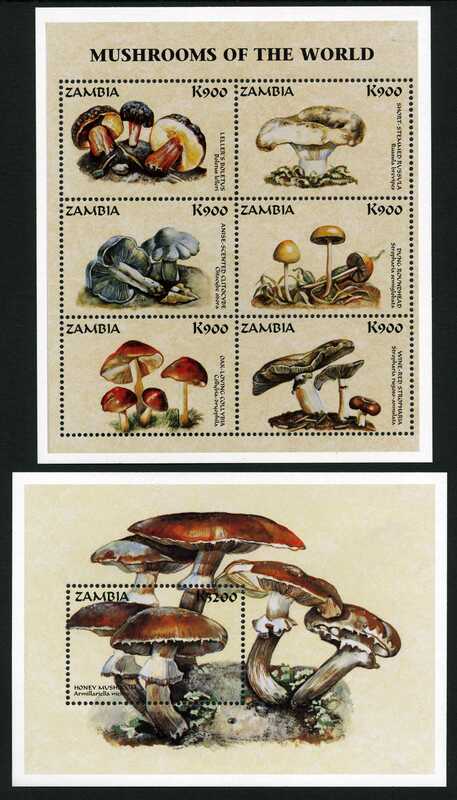 Zambia (formerly Northern Rhodesia) 2002 MS898 Minisheet, 100 x 70 mm, 8000k face value, featuring Psathyrella piluliformis. 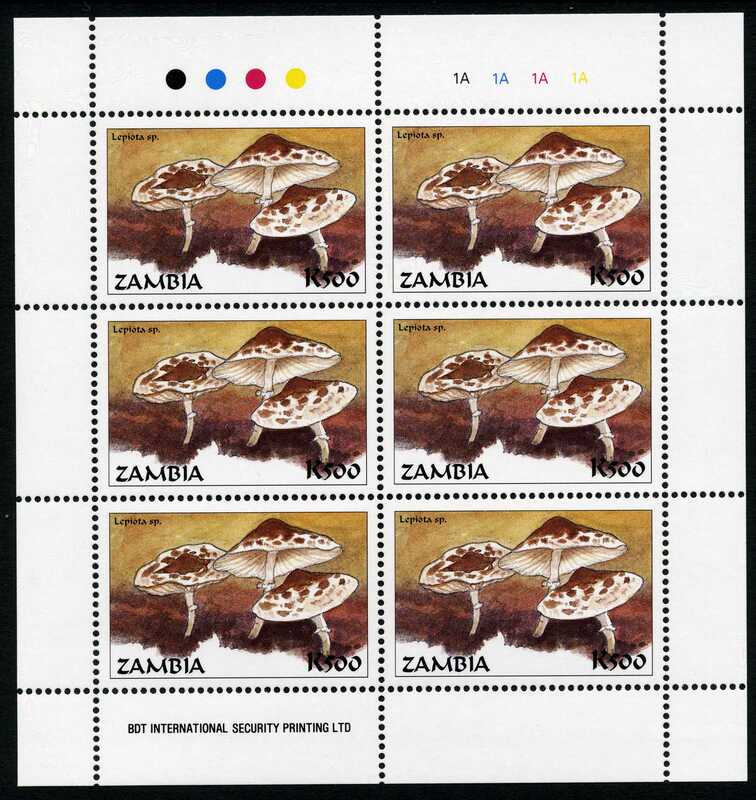 ONE of a set of 3 sheets the others feature the Arum lily and the African monarch butterfly. 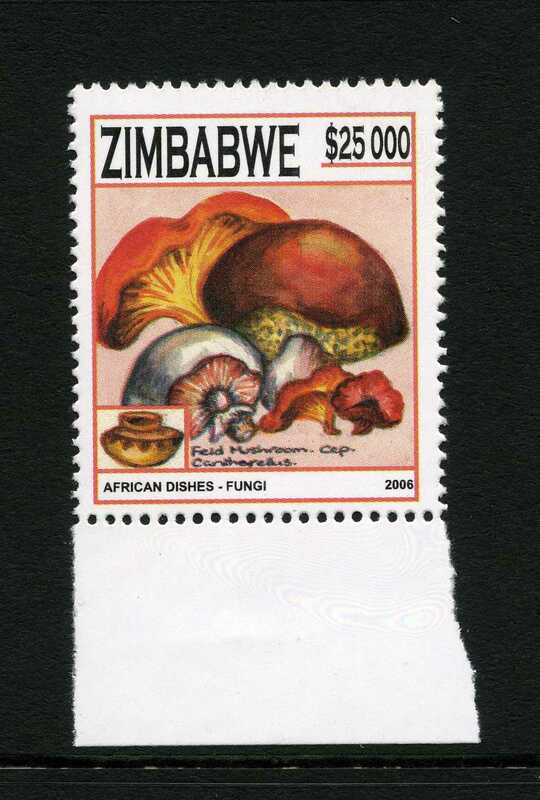 Zimbabwe (formerly Southern Zhodesia) 1992 828 Termitomyces sp.